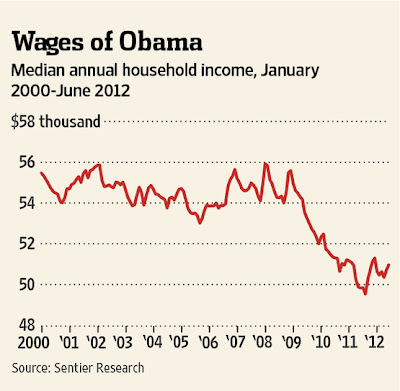 The Obama years have been brutal on middle-class incomes. Add the authors: "The overall decline since June 2009 was larger than the 2.6 percent decline that occurred" during the recession from December 2007 to June 2009. For household income, in other words, the Obama recovery has been worse than the Bush recession. It's true that the Bush years overall were also not great for household incomes. According to Sentier's analysis, real median household income is down about 8% from $55,470 in 2000 before the dot-com bubble burst. Some of this decline is due to the continuation of a trend of smaller family size, lower fertility rates and more Americans living alone. But some was also due to the subpar economic growth across the 2000s.